The Giveaway you’ve all been waiting for!!!!! Cute Stuff By JO& CO’s 20k fan giveaway!!!!! $2200 in prizes will be given away to one lucky winner!!!! Look at all of these great goodies!!!! 1) An iPad Mini AND a $500 Cute Stuff By JO & CO Package including flokatis, plush pretzels ( the original braided photography prop ), popular stretch wraps, lil britches & more from Cute Stuff By JO & CO!!! 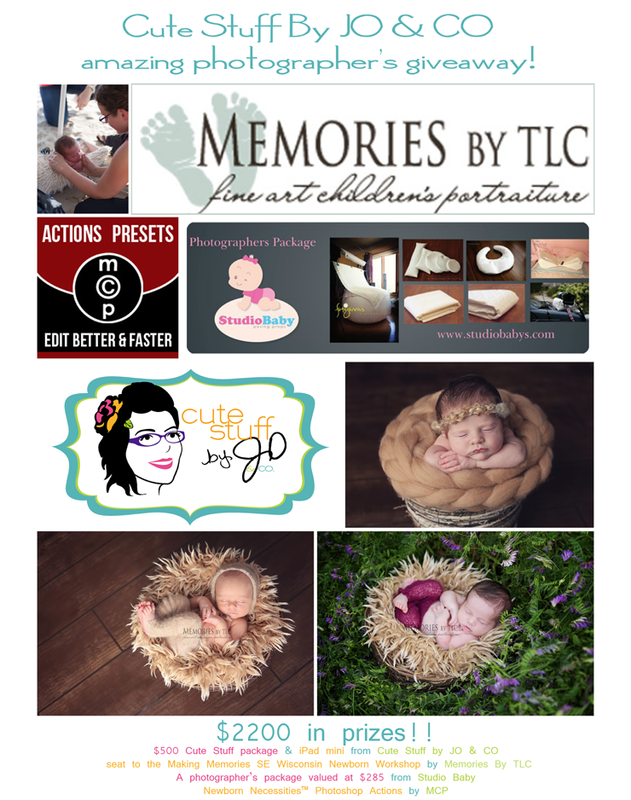 2) A seat to the Making Memories SE Wisconsin Newborn Workshop from Memories by TLC!!! 3) A photographer’s package valued at $285 from Studio Baby Posing Props!!! 4) Newborn Necessities™ Photoshop Actions from MCP Actions. All you need to do to enter the giveaway is go to the Cute Stuff By JO & CO facebook page, find the image below on our fb page, SHARE the facebook photo on YOUR facebook page/fan page (make sure your share is public) and comment that you’ve done so under the image on facebook. Go check out Memories by TLC, Studio Baby, MCP Actions & Cute Stuff by JO & CO on facebook and give them all the *thumbs up*!! You could even leave a nice thank you note for their wonderful contributions to the giveaway! The giveaway will run until noon CST on Friday 6/21. A winner will be chosen at random from the comments on the facebook photo. Such great pics and giveaway. Good work and it makes happy thoughts. Love the great pics. Makes for happy thoughts and you feel good inside looking at the pics. So cute! Great give away.